Ask me how I move documents from one of my Macs to another, or from my Mac to my iPad or iPhone, and I’ll probably say, “Dropbox.” I hardly ever think of using iCloud’s Documents in the Cloud feature to share or transfer documents among my devices. The reason, I think, is that Apple’s interface to iCloud is so poor, especially on the desktop with OS X 10.8 Mountain Lion, and especially in comparison to Dropbox’s interface. My Dropbox folder is, happily, just an ordinary folder in the Finder, giving me direct Finder access to a central repository holding everything I’m keeping in the cloud through Dropbox. Simple, obvious, direct, and easy to use. In contrast, iCloud documents maintained as Documents in the Cloud are shown in a totally different way. They aren’t usually visible in the Finder at all! Instead, you see them only in a peculiar, substandard, iOS-like Open dialog, and only within one particular application. That situation is frankly ridiculous. I shouldn’t have to launch (say) TextEdit, let alone choose File > Open within it, just to see my TextEdit documents, merely because they happen to be mirrored into the cloud! And there’s no reason why my iCloud documents should be tied to a single application in the first place, especially seeing as the division is arbitrary: a document kept in, say, TextEdit’s cloud folder doesn’t have to be a TextEdit document — it can be anything at all. With some difficulty, and if you’re willing to play the role of Power User, you can see your iCloud documents in the Finder’s folder hierarchy, if you really want to. They are stored in your Library folder, in a subfolder called Mobile Documents. The Finder, however, fights quite hard to prevent you from seeing what’s really going on here. The Library folder is normally invisible (though you can fix that; see “Dealing with Lion’s Hidden Library,” 20 July 2011), and the Finder insists on titling the Mobile Documents folder’s window as “iCloud”. And is this view of your iCloud documents, even if you can be bothered to arrange to see it, of any real use? It might be more of an invitation to damage something. The promise of the Cloud Mate utility, from Red When Excited, is to make your access to iCloud documents more like your access to Dropbox documents. It does this in two ways. 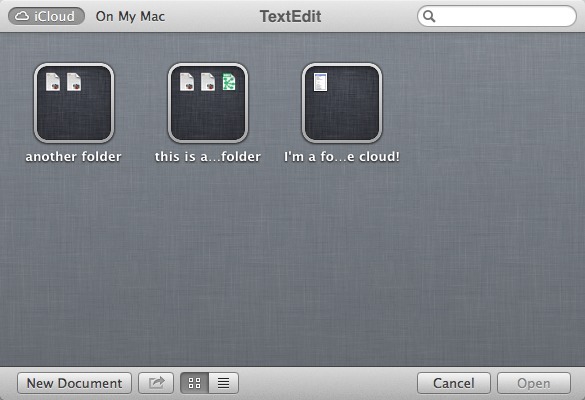 Cloud Mate’s first way of showing you your iCloud documents is through its own window. The Cloud Mate window’s sidebar lists your iCloud-enabled applications, and you can view only one application’s documents at a time; but at least the window is somewhat Finder-like. You can create folders, and rename files and folders, in Cloud Mate’s window, and you can drag files and folders from the Finder into it. You can also drag files and folders out of this window, or from one application’s domain into another application’s domain. (If you try this, note that there’s a slight delay where you must hold down for a while on an icon before it becomes draggable.) And the Cloud Mate application helps you avoid losing data by ensuring that just about every form of dragging makes a copy rather than moving files. The second way in which Cloud Mate shows you your iCloud documents is via a virtual Finder volume that unifies access to the various iCloud document folders. This magic is performed through an installation of OSXFUSE. OSXFUSE, the successor to MacFUSE, is a low-level piece of software that enables developers, in effect, to construct their own file systems. That scares me somewhat, but I suppose my fears are irrational, and besides, you don’t have to use this feature if you don’t want to. In this case, OSXFUSE is being used to gather up the contents of ~/Library/Mobile Documents and make those contents appear more normal. The funny folder names such as com~apple~TextEdit are turned into ordinary names such as TextEdit, and the contents of their Documents subfolders are hoisted up to the top level. The resulting virtual file system forms a volume that you can then access in a genuine ordinary Finder window, giving you all the normal power of the Finder but with a cleaner interface than looking into the Mobile Documents folder directly. The resulting Finder window isn’t quite as magical as one might hope. Column view works well, and I recommend that you stick to it. But the iCloud document folders, although you can dive into them one at a time in column view, are portrayed as file aliases in list view, so they have no “flippy triangle” that might be clicked to open them hierarchically to view their contents simultaneously within the same window. Nevertheless, this is a clever and useful way of exploring your iCloud documents directly in the Finder. As with Dropbox, you need to be a little careful if you don’t want to commit your only copy of something to iCloud. If you drag a file into an iCloud document folder on this virtual volume, you move the file; alternatively, of course, you can hold Option as you drag, or use Copy and then Paste, to get a copy. Similarly, if you drag a file out of an iCloud document folder onto, say, the desktop, you are removing it from iCloud (and a dialog warns you of this). None of that, however, is surprising; indeed, it’s delightful. 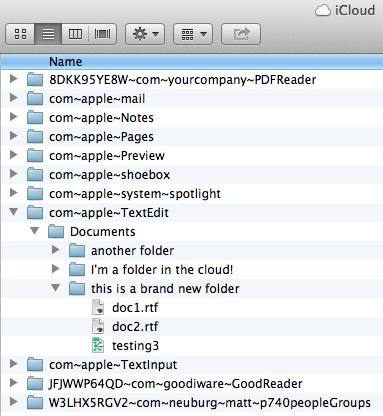 This is just the Finder acting the way the Finder normally acts and having those actions reflected on iCloud. The virtual Finder volume generated by OSXFUSE has another advantage: it’s visible from any application’s Open and Save dialogs, at least in theory. 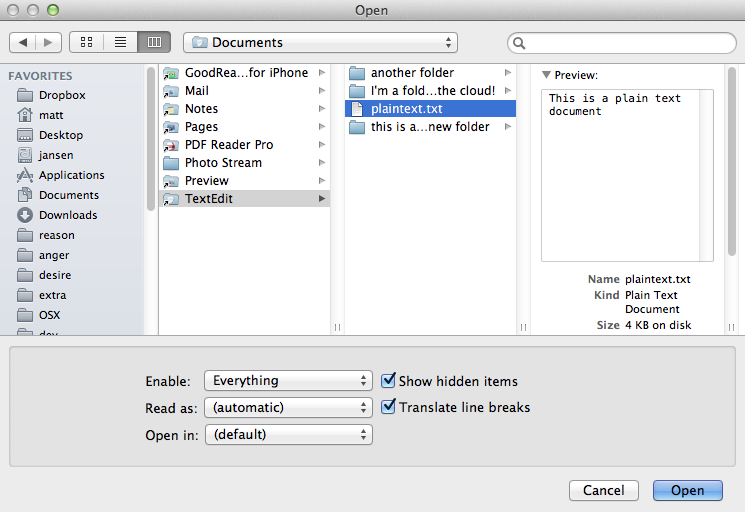 For example, BBEdit’s Open dialog can use it to see and open a text document stored in TextEdit’s iCloud folder, and once open, there’s no problem with saving changes. Unfortunately, this doesn’t work symmetrically for saving a new file via the Save dialog. What an application can do in its Save dialog seems to depend on what kind of application it is. BBEdit’s Save dialog can’t open or enter TextEdit’s iCloud folder to save a new file into it, nor can the Save dialogs in Microsoft Word or TextMate, neither of which are Cocoa apps. Both Pages and Safari can use the Save dialog in TextEdit’s iCloud folder, presumably because they’re Cocoa apps, but they can’t see or save into the subfolders inside TextEdit’s iCloud folder. Another way that Cloud Mate emulates Dropbox is with notifications. Dropbox has long supported Growl notifications, and thus Mountain Lion’s Notification Center. Similarly, Cloud Mate posts notifications to Mountain Lion’s Notification Center when there’s activity related to iCloud documents. Also, Cloud Mate has its own iCloud Monitor window that displays recent iCloud-document activity — though unfortunately its listings of activity vanish almost immediately after they appear, so too bad if you weren’t looking at the necessary moment. Cloud Mate does have its limitations, though. The Cloud Mate main window’s imitation of the Finder isn’t complete, and not even all that Finder-like. It displays only icon view, a view that I never use in the real Finder. The developers, I sense (based on the response I got when I asked about this), intend to add other views, such as list view and column view, so perhaps they’ll get around to it eventually. Similarly, many Finder-like moves that you might try because of Cloud Mate’s Finder-like quality don’t work like the Finder. For example, selecting a file and pressing the Space bar does summon a window similar to Quick Look’s, but it isn’t really Quick Look, and pressing the Space bar again doesn’t dismiss it. Other keyboard shortcuts, such as pressing Command-Up arrow to go up a level in the hierarchy, are missing as well. All of that, however, is forgivable; the truth is that writing an application that works enough like the Finder to make you feel you’re in the same powerful world as the Finder itself is really difficult, and perhaps Cloud Mate’s developers are wise not to have set their sights so high. Indeed, I know of only one application that succeeds in doing such a thing, and that’s Path Finder (see “Path Finder 5 Beats the Finder’s Pants Off,” 29 June 2009). The best view of my iCloud documents that I achieved while playing with Cloud Mate came from marrying Cloud Mate with Path Finder; viewing the OSXFUSE virtual volume created by Cloud Mate through Path Finder in list view does display the entire hierarchy, and is an absolutely delectable experience. If you think that Dropbox-like access to your iCloud documents would be useful, you don’t have to pay much to obtain it. Cloud Mate costs just $6.99 (you purchase your license through FastSpring; an app like this doubtless stands no chance of being approved by Apple for sale in the Mac App Store). It’s a 9 MB download, and requires Mountain Lion. Comments About Cloud Mate: Turning iCloud into Dropbox? iCloud is not only "catching up" in terms of UI, but also far behind on sharing permissions. Dropbox allows sharing any subset of folders or files with any number of other Dropbox users & non-users. Generating download links was possible even in MobileMe -- the web interface for files was quite good! Apple needs to marry idisk and iCloud. Seems to me this is a no brainer! I am using a piece of software called "Plain Cloud" it is freeware that gives you a window with a list of your iCloud software that have folders. You click one of them and it gives you an actual finder window with just that account. You can then move files into and out of that specific folder to anywhere else. I use it to move files to and from my Box.com account. In addition, I use an App called AirFile on my iPad that allows me to "Save As" to any of my Box, DropBox or Google Drive Accounts by using the "Open In Another App" function in each of my iPad Apps. In this way, I can put what ever I want where ever I want. Both iCloud or the other "Cloud" Drives. I will check out Cloud Mat and see how it will work. The AirFile Developer is in the process of making a Mac and PC Desktop App to go with AirFile. I eagerly await this Desktop App as it will totally integrate my work which is now 90%~95% on the iPad. I just wanted to note that I have purchased Cloud Mate to give it a go, and it is like Plain Cloud (Freeware) on Steroids. However, very much worth the money spent! Will make great use of this App! See, Adam, I told you you write all the articles! Matt, my deepest appologies! I have been a reader by eMail of Tidbits for around 18 years and I very rarely come to the site itself... I should have clarified my thanks being for the great site and Tidbits longevity AND your article! It is articles like yours that keep Tidbits going! As we all know Adam can't do it all. Also I for one like having different view pointss that are provided by having a number of authors writing in the same place! It is because of your article that I actually came to the site today! It caught my eye (in the eMail) as the iCloud is an important issue to me personally. Thank you for introducing me to a new piece of software that I would otherwise not have found and Do keep writing! I will be more careful in the future! I just purchased Cloud Mate based on this review. However, it simply does not work the way it is supposed to. First of all, CloudMate it does NOT display all the photos in my PhotoStream, only a small fraction of them. (And YES iCloud is turned on in my System Preferences.) Furthermore, the Move to Trash button is there and selectable but it doesn't do anything. If I go into my PhotoStream from another device and delete unwanted photos, they do not get deleted in the PhotoStream view on Cloud Mate. In fact, I can not find a way to force CloudMate to update what it says is in my PhotoStream--no menu choice, not quitting and restarting. Finally, I have 20+ pages of Notes and NONE of them show up in Notes in Cloud Mate. 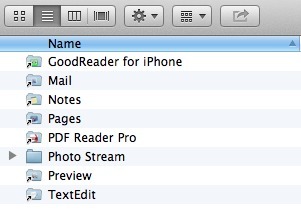 And, yes, Notes is also ON in the iCloud System Preference. So, either I am missing something terribly basic or this app simply does not work. I have requested a refund. If I don't get it, then I will be out 7 bucks for a useless app. Color me frustrated beyond belief! Regarding Notes, remember when they appeared in Mail? I think you'll find Apple still stores the notes as a special folder inside your @iCloud.com mail account, it is just that you use Notes rather then Mail to view them. In the same way Reminders still stores to-do's in the same database as Calendar. Ouch! I've never turned on Photostream so I didn't test. But before blaming Cloud Mate, look directly in ~/Library/Mobile Documents. My com~apple~Notes/Documents folder is empty too. 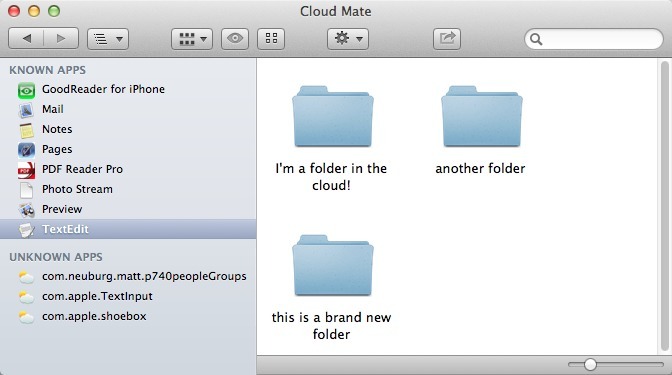 Cloud Mate is just showing you what's in those folders; obviously it can't show you what's not there! Too bad Dropbox didn't just agree to sell out to Apple in the first place. The Cloud Mate UI doesn't even include all the basics. Trying closing the main Cloud Mate window. Then look for a menu item to reopen it. There's not one! How hard would it be to include a "New Cloud Mate Window" item in the File menu? Not hard at all!